came to the rescue. After the long weekend he had a couple of days to spare and decided to come down and help us finish the big guestroom (or as he calls it “my room”). With all the hours of work he has put it, he definitely deserves it and, most importantly, he deserves the biggest hug, a pint of Guinness and the golden key to the guest room. Covered in dust from head to toe. Von Kopf bis Fuß mit Staub bedeckt. After that he cleaned the room, painted the walls with a layer of foundation and two coats of white before he got down to business and layed laminate throughout the room and upstairs hall and cut down the door to size. Nachdem er den Raum gesäubert hatte, hat er nicht nur mit Tiefgrund gestrichen und zweimal gweißelt sondern auch im Zimmer und dem oberen Flur Laminat verlegt und die Tür zurecht gesägt. Thank you so much Dad. We love you. Yes, it is really coming together now. 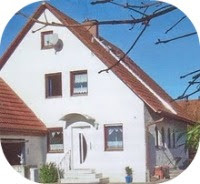 Fußleisten fehlen noch und ein paar Möbel und Deko aber es wird langsam wohnlich :) Hoffen es geht Euch gut. Liebe Grüße nach DXB. OH WAIT, I WILL BE!!!! Melisa Will do. He's going to be thrilled :). I can't wait till you guys are finally here. This is going to be so much fun.